This distinctive monograph examines the dynamic rhetorical processes by which scientists shape, negotiate, and position their work within an interdisciplinary community. Author Ann M. Blakeslee studies the everyday rhetorical practices of a group of condensed matter theoretical physicists, and presents here the first substantial qualitative study of the planning and implementation of discursive practices by a group of scientists. This volume also represents one of the first studies to use situated cognition and learning theory to study how knowledge of a domain's discursive practices is acquired by newcomers. 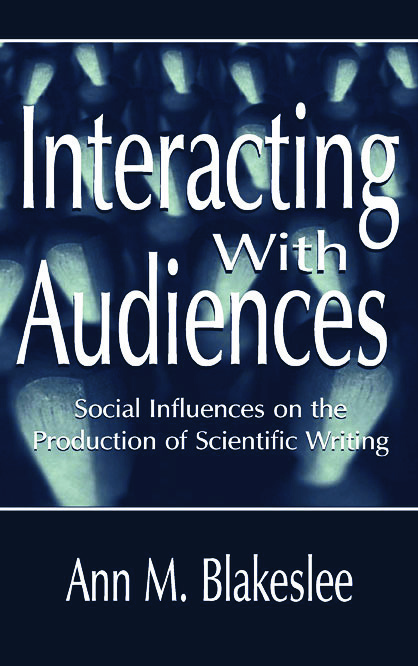 Unlike previous studies of scientists' rhetorical practices, which have focused primarily on the finished or published texts, Blakeslee's involvement with the physicists as they engaged in the composing processes--from jotting down planning notes through publishing a scientific paper--suggests an alternative view of audience based on cooperative interaction between authors and their interlocutors. From this innovative perspective, functional knowledge of audiences comes only by entering into some community of practice, in which readers also become self-defining interlocutors and even participants in joint projects. Blakeslee's research follows the physicists' work into communal, interactive dynamics, looking at their overt attempts to get feedback from members of their audiences, what that feedback was, and how they responded to it. This work addresses and extends a model for audience analysis that consists of two primary operations: getting to know and understand one's interlocutors, and determining how to reach and influence them. In doing so, it offers important insights into the dissemination of scientific information, and thus will be of great interest to scholars and students in the areas of rhetoric of science and technology, composition, rhetorical theory, and scientific writing. "The author unconventionally positions appendixes at the ends of chapters. Footnotes are also included after each chapter, making them possibly more accessible. The book has excellent author and subject indexes….I recommend the book to students of rhetoric and those so interested in how scientists communicate in print….Interacting With Audiences is a complex and useful analysis of the interactions of scientists who write to persuade interdisciplinary readers." "…the book provides a communication framework that scholars may want to consider as cross-disciplinary alliances continue to develop. It also confirms what has been known for quite some time in the communication field: that there is nothing passive about audiences. The process of introducing new ideas and persuading audiences is a dynamic and highly active one." Contents: C. Bazerman, Editor's Introduction. Preface. Scientific Rhetoric in Interactive Practice: Physicists Getting to Know and Speak to Real Audiences. Planning to Persuade: Strategies for Publicizing Ideas and Addressing Audiences. Getting to Know Familiar and Unfamiliar Audiences: Learning About Audiences Within One's Own and Across Different Communities. Following the DOMC Text Into Communal Interactive Dynamics: Authors Getting to Know and Interacting With Audiences in Real Practice. Interacting With Audience Members: Authors Evaluating and Responding to Audience Feedback. Learning to Write in Context: Newcomers Getting to Know and Speak to Audiences. Sorting Out Social Influences: Distinguishing Authorial, Audience, and Other Roles in Scientific Work. Afterword.